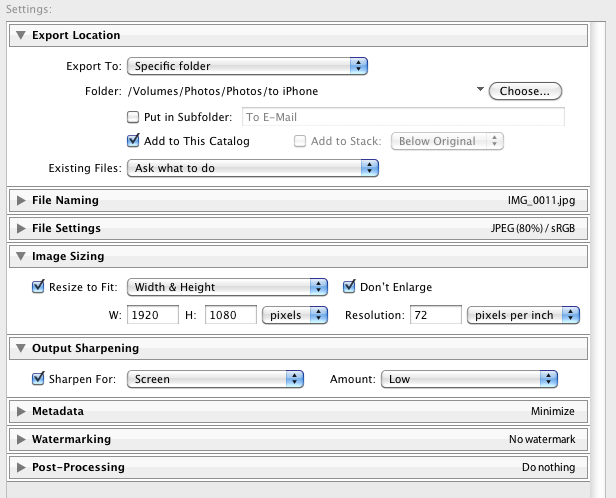 This is a quick tip on an easy way to use Lightroom to manage iPhone pictures back and forth. I found this way of doing useful for me as it avoids the use of iPhoto. I manage all my pictures in Lightroom and I don’t use iPhoto; so I would not want to have to use it just to sync with the iPhone. The objective of this tip is twofold: (1) get iPhone pictures in Lightroom and (2) allow you to have on your iPhone a selection of pictures coming from Lightroom (for example your best shots, which you like to show around). This is pretty easy to use Lightroom in that case, as the iPhone will simply be detected as an available device in the import dialog. I have created a folder called « from iPhone » that will receive all pictures I import from the iPhone. Most of the pictures I take on the iPhone are « single event » or isolated pictures, therefore one single folder is the best. I have then created an import preset which is defined with the target folder just mentioned (« from iPhone ») and with a simple copy of pictures and video into that folder, without creating subfolder. First, in Lightroom, I have created a folder called « to iPhone ». I have then created an export preset (see screenshot below) which I will use to export the pictures from my catalog that I would like to send to the iPhone. The preset is resizing the pictures so they fit within 1920 x 1080 (This is the max resolution I find useful; in case I connect my phone to an HD television for a slideshow), the preset is sharpening them and reducing the quality to 80%. Finally, the pictures are copied into the folder « to iPhone » and I also check the box « add to this catalog ». This means that the folder « to iPhone » is re-sync by Lightroom and you can see directly in your catalog which pictures you have exported and the total amount of pictures currently on the iPhone. Now that I have this folder sitting on my computer with the pictures I’d like to see on my iPhone, how do we get them on the iPhone? We simply use iTunes. The sync dialog of iTunes includes a tab dedicated to pictures synchronization. The first option is to use iPhoto, which gives you the possibility, if you use iPhoto extensively, to synchronize all or only a selection of albums. The second option, more interesting in my case, is to select a folder, which iTunes will use to synchronize your pictures. You can either tell iTunes to sync the whole folder or sync only selected subfolders. So we just have to point iTunes to the folder created earlier « to iPhone ». And that’s it! Why don’t you give it a try if it suits your needs? Leave a comment or a question to share your experience! Cet article a été publié dans ordinateur, photographie avec les mots-clefs : iPhone, iPhoto, lightroom, management, preset. Bookmarker le permalien. Les commentaires et les trackbacks sont fermés.